"UCLA Bruins basketball" redirects here. For the women's team, see UCLA Bruins women's basketball. The UCLA Bruins men's basketball program represents the University of California, Los Angeles in the sport of men's basketball as a member of the Pac-12 Conference. Established in 1919, the program has won a record 11 NCAA titles. Coach John Wooden led the Bruins to 10 national titles in 12 seasons, from 1964 to 1975, including seven straight from 1967 to 1973. UCLA went undefeated a record four times (1964, 1967, 1972, and 1973). Coach Jim Harrick led the team to another NCAA title in 1995. Former coach Ben Howland led UCLA to three consecutive Final Four appearances from 2006 to 2008. As a member of the AAWU, Pacific-8 and then Pacific-10, UCLA set a NCAA Division I record with 13 consecutive regular season conference titles between 1967 and 1979 which stood until passed by Kansas in 2018. UCLA men's basketball has set several NCAA records. In 1919, Fred Cozens became the first head coach of the UCLA basketball and football teams. Cozens coached the basketball team for two seasons, finishing with an overall record of 21–4. Caddy Works was the head coach of the Bruins from 1921 to 1939, guiding them to a 173-159 record. Works was a lawyer by profession and coached the team only during the evenings. According to UCLA player and future Olympian Frank Lubin, Works was "more of an honorary coach" with little basketball knowledge. Wilbur Johns was the UCLA basketball head coach from 1939 to 1948, guiding the Bruins to a 93-120 record. From 1948 to 1975, John Wooden, nicknamed the "Wizard of Westwood", served as UCLA's head coach. He won ten NCAA national championships in a 12-year period, including a run of seven in a row that shattered the previous record of only two consecutive titles; to this day, no other team has won more than two straight titles. Within this period, his teams won a men's basketball-record 88 consecutive games. Prior to Wooden's arrival, UCLA had only won two conference championships in the previous 18 years. In his first season, Wooden guided a UCLA team that had finished with a 12–13 record the previous year to a 22–7 record—then the most wins in a season in program history—and the Pacific Coast Conference (PCC) Southern Division championship. In his second season, Wooden led the Bruins to a 24–7 record and the PCC championship. The Bruins would win the division title in each of the next two seasons and the conference title in the latter season. Up to that time, UCLA had won only two division titles since the PCC began divisional play, and it had not won a conference title of any kind since winning the Southern California Intercollegiate Athletic Conference in 1927. In 1955–56, Wooden guided the Bruins to their first undefeated PCC conference title and a 17-game winning streak that only came to an end in the 1956 NCAA Tournament at the hands of a University of San Francisco team that featured Bill Russell. However, UCLA was unable to maintain this level of performance over the immediate ensuing seasons, finding itself unable to return to the NCAA Tournament as the Pete Newell-coached California teams took control of the conference at the end of the decade. Also hampering the fortunes of Wooden's team during that time period was a probation imposed on all UCLA sports in the aftermath of a scandal involving illegal payments made to players on the school's football team, along with USC, Cal and Stanford, resulting in the dismantling of the PCC conference. By 1962 the probation was no longer in place and Wooden had returned the Bruins to the top of their conference (now the Pac-12 Conference). This time, however, they would take the next step, and go on to unleash a run of dominance unparalleled in the history of college sports. A narrow loss due largely to a controversial foul call in the semifinal of the 1962 NCAA Tournament convinced Wooden that his Bruins were ready to contend for national championships. Two seasons later, the final piece of the puzzle fell into place when assistant coach Jerry Norman persuaded Wooden that the team's small-sized players and fast-paced offense would be complemented by the adoption of a zone press defense. The result was a dramatic increase in scoring, giving UCLA a powerhouse team led by Walt Hazzard and Gail Goodrich that went undefeated on its way to the school's first basketball national championship. Wooden's team repeated as national champions the following season before the squad fell briefly in 1966 when it finished second in the conference to Oregon State. UCLA was ineligible to play in the NCAA tournament that year because in those days only conference champions went to the tournament. However, the Bruins' incarnation returned with a vengeance in 1967 with the arrival of sophomore All-America and MVP Lew Alcindor. The team reclaimed not only the conference title but the national crown with an undefeated season. In January 1968, UCLA took its 47-game winning streak to the Astrodome in Houston, where Alcindor squared off against Elvin Hayes in the Game of the Century, which was the nation's first nationally televised regular season college basketball game. Houston upset UCLA 71-69 behind Hayes' 39 points. In a post-game interview, Wooden stated, "We have to start over." They did, and went undefeated the rest of the year, avenging Houston 101-69 in the semi-final rematch of the NCAA tournament en route to the national championship. Hayes, who had been averaging 37.7 points per game, was held to only 10 points. Wooden credited Norman for devising the diamond-and-one defense that contained the Houston center. The emergence of the Bruins under Wooden vastly increased the program's popularity. Since 1932, the Bruins had played at the Men's Gym. It normally seated 2,400, but had been limited to 1,500 since 1955 by order of the city fire marshal. This forced games to be moved to Pan Pacific Auditorium, the Los Angeles Memorial Sports Arena and other venues around Los Angeles when larger crowds were expected—an increasing inconvenience since the Bruins' first national title. At Wooden's urging, a much larger on-campus facility was built in time for the 1965–66 season, the nearly 13,000 seat Pauley Pavilion, . Wooden coached his final game in Pauley Pavilion on March 1, 1975, when UCLA trounced Stanford 93–59. Four weeks later, following a 75–74 overtime victory over Louisville in the 1975 NCAA Tournament semifinal game, Wooden announced that he would retire at age 64 immediately after the championship game. His legendary coaching career concluded triumphantly, as his team responded with a win over Kentucky to claim Wooden's first career coaching victory over the Wildcats and his unprecedented 10th national championship in a twelve-year span. During his tenure with the Bruins, Wooden became known as the "Wizard of Westwood", although he personally disdained the nickname. He gained lasting fame at UCLA by winning 620 games in 27 seasons and 10 NCAA titles during his last 12 seasons, which included seven in a row from 1967 to 1973. His UCLA teams also had a then-record winning streak of 88 games and four perfect 30–0 seasons. They also won 38 straight games in NCAA Tournaments and 98 straight home game wins at Pauley Pavilion. Wooden was named NCAA College Basketball's "Coach of the Year" in 1964, 1967, 1969, 1970, 1971, 1972 and 1973. In 1967, he was named the Henry Iba Award USBWA College Basketball Coach of the Year. In 1972, he shared Sports Illustrated magazine's "Sportsman of the Year" award with Billie Jean King. He was named to the Basketball Hall of Fame as a coach in 1973, becoming the first to be honored as both a player and a coach. From 1975 to 1977, Gene Bartow served as the head coach of UCLA. He guided them to a 52–9 record, including a berth in the 1976 Final Four. He coached the 1977 College Player of the Year, Marques Johnson. Gary Cunningham became the head coach at UCLA in 1977. He coached two seasons, winning the Pacific-8 and Pacific-10 conference championships and leading UCLA to a #2 ranking in the final polls both seasons. Larry Brown then moved on to coach UCLA from 1979–1981, leading his freshman-dominated 1979–80 team to the NCAA title game before falling to Louisville, 59–54. However, that runner-up finish was later vacated by the NCAA after two players were found to be ineligible. This was one of the few times a Final Four squad had its record vacated (Villanova had its runner-up finish vacated in 1971 because Howard Porter had signed a pro contract). Larry Farmer was the head coach of UCLA from 1981 to 1984, guiding them to a 61–23 (.726) record. He had recruited Earvin "Magic" Johnson to come play at UCLA, but then told Johnson to hold off on a visit as he was more interested in Albert King. Neither played for UCLA. In 1984, Walt Hazzard was named the UCLA basketball coach twenty years after he was an All-America when UCLA won its first national championship. He coached for four seasons, winning 77 out of 125 games. The 1984–1985 UCLA Bruin basketball team won the NIT championship. 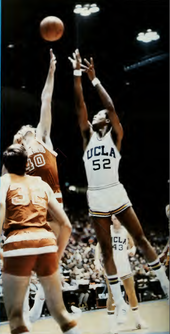 The 1986–1987 UCLA Bruin basketball team won both the Pac-10 regular season championship as well as the inaugural Pacific-10 Conference Men's Basketball Tournament. In 1988, Jim Harrick returned to UCLA (he had spent two years as an assistant coach from 1978 to 1979) to assume head coaching duties after the firing of Walt Hazzard. During the recruiting period before his first season, he recruited Don MacLean, the most significant recruit to commit to UCLA in several years. McLean's arrival helped start a revival of the basketball program. Within four years, the Bruins were in the Elite Eight--"officially" their deepest advance in the tournament in 13 years, and only the second time they had gone that far since Wooden's departure. During the 1994–1995 season, he led UCLA to a 31-2 record (a loss to California was subsequently forfeited to the Bruins) and the school's eleventh national championship, its first since the 1974–75 season. The 31 wins would stand as a school record until the 2005–06 season. In 1996, Harrick's Bruins were upset in the first round by Princeton. Shortly before the 1996 season, UCLA fired Harrick for lying about who attended a recruiting dinner. At the time, he was the second-winningest coach in school history. On the departure of assistants Mark Gottfried and Lorenzo Romar for head coaching jobs shortly after the 1995 NCAA Championship season, Steve Lavin, as the assistant with the longest tenure at UCLA, was selected as interim head coach. Later that season on February 11, 1997, with the Bruins tied for first place in the Pac-10 with an 8–3 record, UCLA removed the "interim" tag from Lavin's title and formally named him as its 11th head coach. The Bruins then won their next 11 games en route to the Pac-10 title, before being eliminated by the Minnesota Gophers in the NCAA Midwest Regional Final. In seven seasons as head coach Lavin's record was 12–4 in games involving overtime. Additionally Lavin's Bruins had a 10–4 record against the rival USC Trojans. During the period 1997–2002, Lavin's Bruins compiled nine consecutive overtime victories. These included victories over Arizona, Cincinnati (2002 NCAA second round double overtime victory over No. 1 West Region seed), Kentucky, and Stanford (then ranked No 1). The Stanford win was sealed by a last second jumper by star sophomore guard JaRon Rush. At UCLA from 1996 to 2003, Lavin compiled a record of 145–78. As both an assistant and head coach, Lavin participated in 13 consecutive NCAA tournament appearances (1990–2002), while working at Purdue and UCLA. During Lavin's tenure as a head coach, he was one of only two coaches in the country to lead his team to five NCAA "Sweet 16s" in six years (1997, 1998, 2000–2002), the other coach being Duke's Mike Krzyzewski. Lavin guided UCLA to six consecutive seasons of 20 or more wins, as well as six consecutive NCAA tournament appearances. Lavin signed seven McDonald's High School All-Americans. Seven of Lavin's former Bruin recruits became roster members of NBA teams: Trevor Ariza, Matt Barnes, Baron Davis, Dan Gadzuric, Ryan Hollins, Jason Kapono, and Earl Watson. During Lavin's tenure as head coach, the Bruins qualified for six consecutive NCAA Tournaments (1997–2002). Lavin's record in the first and second rounds of the NCAA tournament is 10–1. His winning percentage (90.9%) in the first two rounds is second only to Dean Smith in NCAA Tournament history. However, Lavin also coached the Bruins to their only loss in an NCAA tournament game played in the State of California (a 2002 loss to Missouri in San Jose). In seven seasons as head coach Lavin's record was 12–4 in games involving overtime. The Bruins defeated the No. 1 team in the country in four consecutive collegiate seasons: Stanford in 2000 and 2001, Kansas in 2002 and Arizona in 2003. In March 2003, following UCLA's first losing season (10–19) in 55 years, Lavin was fired. Despite some success under the watch of Steve Lavin, the program wanted to regain its position in the college basketball upper echelon. Even the success in the NCAA tournament belied the fact that UCLA had earned no better than a number 4 seed with the exception of the 1997 season. The 2002–03 season turned out to be the back-breaker for Lavin as the Bruins stumbled to a 10–19 record and a 6–12 record in the conference. It was the first losing season for UCLA in over five decades. Lavin was dismissed following the season. UCLA looked to find a coach that could move the Bruins back to the elite ranks of the Pac-10 and the country. Ben Howland's success at the University of Pittsburgh and his southern California roots made him an attractive candidate. In 2003, he left Pitt and accepted the head coaching duties at UCLA. Howland remedied this disappointment in his recruiting efforts. Howland produced a top tier recruiting class from athletes in southern California that fit his Big East style. Behind Lavin hold-over Dijon Thompson and Howland recruits Jordan Farmar and Arron Afflalo, UCLA produced a winning season for the first time in three years and returned to the tournament, where they lost in the first round. Starting the 2005–06 season with the majority of the roster made over in Howland's image and with the Lavin hold-overs (e.g., Ryan Hollins and Cedric Bozeman), the Bruins produced an excellent campaign. They finished the regular season 24–6, winning the Pac-10 Conference title. They then roared through the Pac-10 tournament, winning each game by double digits en route to only the second Pac-10 tournament championship in school history. The momentum continued into the NCAA tournament as the second-seeded Bruins defeated Gonzaga in the Sweet Sixteen. They then upset top-seeded Memphis to reach the school's first Final Four in 11 years. The run ended in the championship game against Florida, whose imposing front-line proved to be a matchup problem for the Bruins. Howland continued his success at UCLA the following year. The Bruins finished undefeated at home for the first time in 22 years, winning the Pac-10 conference title. However they lost in their first Pac-10 tournament game and were seeded second in the NCAA Tournament West Region. After a close second-round win over Indiana, Howland led the Bruins to a win over his former team, Pitt in the Sweet Sixteen. The Bruins then again upset the top seed in the West Region, Kansas, and reached the second of UCLA's first consecutive Final Fours since the John Wooden era, only to lose again to Florida in the national semifinal. 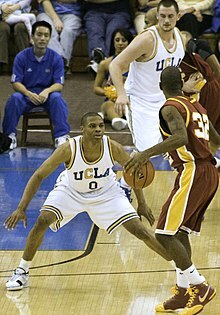 At the start of the 2007–08 season, expectations for UCLA were the highest ever with the arrival of Kevin Love, one of the best low-post prospects in the high school class of 2007. Combined with the emergence of Russell Westbrook and Darren Collison in the back-court, the Bruins won their 3rd consecutive Pac-10 conference title, and their second Pac-10 tournament title in three years. They received their first #1 seed in the NCAA tournament since 1995, and once again reached the Final Four, where they faced another top seed, the Memphis Tigers. Memphis got the better of the Bruins, who returned to Westwood without a championship once again. However, the Bruins program under Howland began to struggle in subsequent seasons. After 2008, UCLA did not advance past the first weekend of the NCAA tourney, and did not qualify for the tournament in 2010 and 2012. With a 77-73 victory over Penn on December 10, 2011; Howland passed Jim Harrick for second on UCLA's all-time wins list behind John Wooden. Nonetheless, questions about how Howland was running the program began to come into focus. In February 2012, a Sports Illustrated article portrayed UCLA player Reeves Nelson as a bully on and off the court, who at times intentionally tried to injure his teammates. According to the article, Howland looked the other way and did not discipline Nelson for over two years. From 2008—the Bruins last Final Four appearance—through 2012, at least 11 players left the UCLA program. Although the 2012–2013 Bruins won the Pac-12 regular season championship, they quickly bowed out in the first round of the NCAA tournament. On March 25, 2013, three days after being eliminated by 11th seed Minnesota, UCLA fired Howland. On March 30, 2013, Steve Alford signed a seven-year, $18.2-million contract to become the head coach of UCLA, replacing the fired Ben Howland. In his first year as head coach Alford led UCLA to a Pac-12 tournament championship, a feat not accomplished since 2008. The team later went on to the Sweet Sixteen of the NCAA Division I Men's Basketball Tournament as a 4 seed in the South regional before losing to the 1 seed Florida. In his second year, the team was controversially chosen to participate in the 2015 NCAA Division I Men's Basketball Tournament as an 11 seed in the South Region, where they upset the 6 seed SMU on a game-winning goaltending call. The Bruins went on to defeat the University of Alabama at Birmingham Blazers before losing to Gonzaga in the Sweet Sixteen. After a disappointing third season in which UCLA suffered their fourth losing record since 1948, the team rebounded in the following season, going 31-5 before falling to Kentucky, again in the Sweet Sixteen, considered an underachievement given the talent level and overall record of the team. Freshman point guard Lonzo Ball, as well as the program in general, garnered national media attention for the outspoken behavior of his father LaVar Ball. Prior to the beginning of the 2017-18 season, the team travelled to China to participate in the annual Pac-12 China Game. On November 6 in Hangzhou, during a block of free time allotted to the players, freshmen LiAngelo Ball, Cody Riley and Jalen Hill shoplifted sunglasses from a Louis Vuitton department store. They were placed under house arrest by local police the next day and required to hand over their passports. The controversy garnered immense attention due to the reputation of LiAngelo as a member of the Ball family and received significant media coverage. President Donald Trump, who was concurrently visiting China, reportedly asked General Secretary Xi Jinping to pardon the three men, and they were released back to the United States shortly after, although Ball's family questioned if the President's request was a direct reason for the release. The players were placed on suspension from basketball activities, and were eventually suspended for the entirety of the season on December 22. Believing the suspension to have been unearned, LaVar Ball preemptively withdrew LiAngelo from UCLA and had him sign with an agent, making him ineligible for further NCAA competition. UCLA finished the regular season in a three-way tie for third (tied with Utah and Stanford) in the Pac-12 (21-10, 11-7), disappointingly falling to St. Bonaveture in the NCAA First Four Play-in Round. Junior guard Aaron Holiday was named to the First-team All-Pac-12 and the Pac-12 All Defensive Team, the first player to do so in the Alford era. Holiday was drafted 23 by the Indiana Pacers in the First Round of the 2018 NBA Draft. UCLA started the 2018–19 season ranked No. 21 in the AP Poll and won seven of its first nine games. However, they concluded non-conference play with four consecutive losses, including back-to-back home losses to mid-major teams Belmont and Liberty. The 73–58 loss to Liberty on December 29 was UCLA's most lopsided home loss in Alford's tenure. Two days after that loss, UCLA announced that Alford had been fired and that assistant coach Murry Bartow would serve as interim head coach for the remainder of the season. They failed to qualify for the NCAA Tournament, and ended the decade without a Final Four appearance for the first time since the 1950s. On April 9, 2019, UCLA announced the hiring of Mick Cronin as the program's 14th head coach. The men's basketball team played in the 2,400 seat Men's Gym from 1932 to 1965. They also played at other venues around Los Angeles, including the Pan-Pacific Auditorium and Los Angeles Memorial Sports Arena, when larger crowds were expected for games. UCLA Bruins vs. Oregon State Beavers, January 2013, in the "New Pauley Pavilion"
Following UCLA's second championship in 1965, the idea of constructing a new arena to accommodate increased interest in the team was proposed. In 1965, Pauley Pavilion was built on campus and has been the home of the Bruins basketball programs since that time. During the 2011–12 season, Pauley Pavilion underwent a complete, $136 million renovation, both inside and out, earning it the nickname of "New Pauley." A new attendance record was set on March 2, 2013 when 13,727 fans watched the Bruins defeating the Arizona Wildcats 74–69. The Mo Ostin Basketball Center will be built south of the Los Angeles Tennis Center and close to Pauley Pavilion, the basketball team's home court to serve as a practice facility and hub for the basketball team. On December 14, 2015, Russell Westbrook donated a "significant" sum to the construction of the Center, for which the facility's court was named in his honor. Westbrook's former teammate, Kevin Love, matched his contribution on September 20, 2016, for which the strength and conditioning center was named after him. The team has had 12 head coaches in its history, and they have won 11 NCAA Championships, the most of any school. John Wooden won 10 national championships between 1964 and 1975, and Jim Harrick won the other in 1995. The New York Times wrote that Wooden "made UCLA the most successful team in college basketball." After Wooden retired, the four coaches that succeeded him resigned, and the following three—Harrick included—were fired. The average tenure of those coaches after Wooden was four years. [a] Former coach Ben Howland led the Bruins to three consecutive Final Four appearances from 2006 to 2008. UCLA had a basketball rivalry with Notre Dame that started when Digger Phelps was the Notre Dame coach and John Wooden was the UCLA coach. UCLA and Notre Dame played a home-and-home meeting for several seasons, which is otherwise uncommon outside conference play. This rivalry existed from the desire of the Notre Dame athletic department to schedule the top schools for intersectional competition. UCLA and Notre Dame played 42 times between 1966 and 1995, and the height of the rivalry was when Notre Dame ended UCLA's consecutive-game winning streak at 88 on January 19, 1974. UCLA also broke a 60-game Notre Dame winning streak in South Bend. Previous UCLA head coach Ben Howland scheduled Notre Dame four times: in 2004, 2005, 2008, and 2009. After UCLA's victory on February 7, 2009, UCLA leads the all-time series 28-19. Since the mid-1980s, UCLA has also had a basketball rivalry with Arizona under coach Lute Olson, as the two schools competed for the Pac-10 Championship every year. Since 1985 the two teams have combined to win 21 out of the 29 conference titles. The UCLA-Arizona basketball rivalry still is seen as the match up of the two premier teams in the conference. Also, the performance of the two schools influences the national opinion of the conference. All individuals were (or will be) inducted as players unless otherwise noted. All individuals were inducted as coaches, though not necessarily for their service at UCLA. John Wooden (1972) – Also inducted separately as a player in 1961 for his career at Purdue and in early professional leagues. See also: Category:UCLA Bruins men's basketball players. Six former UCLA Bruins went on to be named to the Naismith Memorial Basketball Hall of Fame: Kareem Abdul-Jabbar, Reggie Miller, Gail Goodrich, Jamaal Wilkes, Bill Walton and Don Barksdale. Barksdale was also notable as the first player to break many color barriers, including being the first African American to be named an NCAA All-American and NBA All-Star, and the first to be selected to the US Olympic basketball team. UCLA became the first school to have a top winner in both basketball and football in the same year with Gary Beban winning the Heisman Trophy and Lew Alcindor (now Kareem Abdul-Jabbar) winning the U.S. Basketball Writers Association player of the year award in 1968. UCLA has produced the most NBA Most Valuable Player Award winners, six of them by Abdul-Jabbar, one to Walton, who was Abdul-Jabbar's successor, and one to Russell Westbrook. As of the 2018–19 NBA season[update], 98 former UCLA players have played in the NBA. At the 2015 NBA All-Star Game and the 2016 NBA All-Star Game, former Bruins Russell Westbrook of the Oklahoma City Thunder was the MVP and Zach LaVine of the Minnesota Timberwolves was the winner of the Slam Dunk Contest. Former UCLA guard Lonzo Ball, the second pick in the 2017 NBA draft, was the first player ever with his own signature shoe (ZO2) entering the draft (he’s signed with family company Big Baller Brand). The UCLA Bruins lead the all-time series vs. all other eleven Pac-12 opponents. In the Pac-12, only Arizona currently leads the series against more than eleven of its conference opponents. Note all-time series includes non-conference matchups and the Pac-12 Tournament. ^ There were 28 seasons from 1975–76 to 2002–03 and 7 coaches, an average of 4 years. The Yahoo article said 3.9. ^ Hollyfield is generally credited with being on three championship teams (1971–1973). While he played in 1970–71, he was ineligible to play in the 1971 postseason due to NCAA restrictions on junior college transfers. ^ "UCLA Athletics Brand Guidelines" (PDF). June 29, 2017. Retrieved July 22, 2017. ^ "No. 3 Kansas routs TCU 87-68 to clinch share of Big 12 title". ESPN.com. ^ "Kentucky, N. Carolina, UCLA, Kansas, and Duke "The Phat 5" of College Basketball at 500 Report Volume #8 (NBA All-Star Week)". Retrieved July 31, 2018. ^ "An Olympian's Oral History" (PDF). Retrieved April 26, 2017. ^ a b c d "John Wooden: A Coaching Legend". UCLABruins.com (official athletic site of the UCLA Bruins). Archived from the original on April 17, 2009. Retrieved January 24, 2010. ^ a b c Mike Puma (2007). "Sportscentury Biography: Wizard of Westwood". ESPN. Retrieved January 25, 2010. ^ "UCLA History" (PDF). UCLA. 2007. pp. 118–126. Retrieved January 29, 2010. ^ a b c Alex Wolff (June 4, 2010). "How '64 Bruins made John Wooden". SI.com. Retrieved July 21, 2010. ^ Gasaway, John (June 7, 2010). "John Wooden's Century". Basketball Prospectus. Archived from the original on July 22, 2015. ^ "Wooden hangs 'em up". Eugene Register-Guard. Associated Press. March 30, 1975. Retrieved July 23, 2010. ^ Mark Schlabach (April 1, 2006). "A Tradition Lacking Swagger: Storied UCLA Fails to Worry Frisky LSU". Washington Post. Retrieved February 7, 2010. ^ Brendan Murphy (July 11, 2007). "Trinity squash nears decade with nation's longest winning streak". ESPN. Retrieved February 7, 2010. ^ "John R. Wooden (coach)". Naismith Memorial Hall of Fame. Archived from the original on August 31, 2009. Retrieved January 24, 2010. ^ "Finally forgiven: The Howard Porter story - Newtown 100". December 14, 2014. Retrieved July 31, 2018. ^ Larry Bird; Earvin Johnson; Jackie MacMullan (November 4, 2009). When the Game Was Ours. Houghton Mifflin Harcourt. pp. 13–. ISBN 978-0-547-41681-6. ^ Anderson, Shelly (November 10, 2006). "Anderson: Howland still calls Pitt family". Pittsburgh Post-Gazette. Retrieved January 15, 2010. ^ "Love-fest: Hoop phenom says he'll attend UCLA". ESPN.com. July 25, 2006. Retrieved July 31, 2018. ^ Goodman, Jeff (March 23, 2014). "Ben Howland interested in job". ESPN. Archived from the original on March 23, 2014. ^ Dohrmann, George (March 5, 2012). "Special Report: Not the UCLA Way". Sports Illustrated. Archived from the original on February 29, 2012. ^ Foster, Chris (February 29, 2012). "UCLA disputes Sports Illustrated depiction of basketball program". Los Angeles Times. Archived from the original on February 14, 2014. ^ Holmes, Baxter (November 28, 2012). "Joshua Smith calls it quits at UCLA". Los Angeles Times. Archived from the original on February 19, 2014. ^ Plaschke, Bill (March 24, 2013). "UCLA wants more than Ben Howland could deliver—and it's entitled to". Los Angeles Times. ^ "Ben Howland fired at UCLA after 10 seasons with Bruins, coach says he was 'blessed' to lead program for a decade". NY Daily News. Retrieved March 25, 2013. ^ "UCLA hires Steve Alford as basketball coach; he has big job ahead". Los Angeles Times. March 30, 2013. ^ "WATCH: LaVar Ball Predicts UCLA Will Win the National Championship". Retrieved July 31, 2018. ^ Gonzalez, Eduardo. "LaVar Ball on UCLA basketball: 'Can't win no championship with three white guys'". latimes.com. Retrieved July 31, 2018. ^ "Move over, Stephen Curry. Lonzo Ball — or his Dad — is coming to take your place". February 19, 2017. Retrieved July 31, 2018. ^ "Three UCLA basketball players, including LiAngelo Ball, are questioned by police in China about shoplifting". Los Angeles Times. November 7, 2017. ^ "Trump asked Xi to look at cases of UCLA basketball players". CNN. November 14, 2017. ^ "UCLA suspends Cody Riley, Jalen Hill for season for China shoplifting". CBS Sports. December 23, 2017. ^ "LaVar Ball pulls suspended LiAngelo out of UCLA". New York Post. December 4, 2017. ^ "UCLA's Aaron Holiday is a big winner on All-Pac-12 teams". Los Angeles Times. March 5, 2018. ^ Thamel, Pete (April 3, 2019). "UCLA's latest Final Four appearance comes as a punchline". Yahoo! Sports. Retrieved April 5, 2019. ^ "Facilities - Pauley Pavilion - UCLA". UCLA. Retrieved July 31, 2018. ^ Schilken, Chuck. "Russell Westbrook makes largest donation ever to UCLA by a former Bruins basketball player". latimes.com. Retrieved July 31, 2018. ^ "Kevin Love matches Russell Westbrook's record-setting donation to UCLA basketball facility". September 20, 2016. Retrieved July 31, 2018. ^ "Top 10 Colleges to Produce NBA Pros". RealClearSports. June 21, 2011. Archived from the original on March 23, 2012. ^ Litsky, Frank (March 18, 2003). "Formality Is Reality As U.C.L.A. Fires Lavin". The New York Times. Archived from the original on March 29, 2012. ^ Wetzel, Dan (March 29, 2006). "Westwood's new look". yahoo.com. Yahoo! Sports. Archived from the original on March 29, 2012. ^ Dwyre, Bill (February 11, 2011). "Ben Howland keeps cool on the UCLA basketball hot seat". Los Angeles Times. Archived from the original on March 29, 2012. ^ DUFRESNE, CHRIS (February 7, 2009). "UCLA vs. Notre Dame: A rivalry the way they used to be". Retrieved July 31, 2018 – via LA Times. ^ Foster, Chris – UCLA, Arizona need to raise Pac-12 level. Los Angeles Times, March 2, 2013. Quote: California Coach Mike Montgomery, "...If those two are not good, the conference is not perceived as being good. People don't give credit to the schools across the board in the league." ^ "Player Season Finder - Basketball-Reference.com". Basketball-Reference.com. Retrieved July 31, 2018. ^ Haylock, Rahshaun (May 30, 2012). "Former Bruin Hollyfield still winning". FoxSports.com. Archived from the original on May 30, 2015. ^ "1971 Men's Basketball Team Celebrates 40th Anniversary" (Press release). UCLA Athletics. February 26, 2011. Archived from the original on May 29, 2015. Retrieved April 23, 2015. ^ Berger, Dan (April 8, 1971). "Don't Count Wooden's Whiz Kids Out Next Season". The Sun. San Bernardino, California. Associated Press. p. D-6. Retrieved May 30, 2015 – via Newspapers.com. ^ Crowe, Jerry (April 3, 2009). "Kobe Bryant vs. Ron Artest is worth hearing". Los Angeles Times. Archived from the original on May 28, 2015. ^ Patton, Robes (April 5, 1994). "Parks Recovers". Sun Sentinel. Archived from the original on May 30, 2015. ^ "NBA & ABA Players Who Attended University of California, Los Angeles". basketball-reference.com. Retrieved April 6, 2012. ^ "Award Winners" (PDF). NCAA.org. 2014. p. 7. Archived (PDF) from the original on March 18, 2015. ^ "UCLA Records from 2011–12 UCLA Men's Basketball Media Guide" (PDF). UCLA Athletic Department. p. 80. Archived from the original (PDF) on March 30, 2012. ^ Timiraos, Alex (2014). "2014–15 UCLA Men's Basketball Media Guide". UCLABruins.com. UCLA Sports Information Office. pp. 122–123. Retrieved March 18, 2015. ^ a b Timiraos 2014, p. 131. Wikimedia Commons has media related to UCLA Bruins men's basketball.